Lard is lush and butter is better! Chapter 12 is my husband’s favourite chapter. It starts off with a really interesting look at what anthropology tells us we have been eating since Australopithecus Lucy first walked upright an estimated 3.5 million years ago. We then have a really useful summary of what fats are, why they are so vital for the human body, where we find the essential fat soluble vitamins – a whistle stop tour of everything you need to know about the nutrition of fats. We have some fun along the way – dissecting a government public advert on saturated fat and showing the breathtaking ignorance of our public authorities; we look at one of my favourite movies and what this tells us about the body’s ability and tendency to make fat. We end with one of the most critical principles of the book. Ever since the Seven Countries Study, when we have been demonising fat, we have, in fact, been talking about processed food – invariably carbohydrates. And still today we are making this huge and fundamental error. We look at what the UK, USA and Australian governments call saturated fat and they are not saturated fat. It is, of course, in the interests of the food manufacturers to keep this myth going, as the last thing they want is for the correct culprit to be identified – processed food. What about high LDL cholesterol levels? What do you recommend to reduce bad cholestorol or does it need to be reduced? LDL is not even cholesterol, let alone bad cholesterol. The chemical formula for cholesterol is C27H46O – there is no good or bad version. LDL stands for Low Density Lipoprotein – this is a microscopic body that is needed to transport substances, which are not water soluble, around the body. If you put olive oil in a glass of water – it doesn’t mix. Fat and cholesterol are not water soluble so they need to be transported around the body in lipoproteins – there are 5 lipoproteins: chylomicrons; VLDL (also called triglyceride); IDL, LDL and HDL (also wrongly called good cholesterol). I highly recommend a book called The Great Cholesterol Con by Dr Malcolm Kendrick – Kenrdick throws out the challenge – how can eating saturated fat raise LDL? I went to see a University biochemist and he couldn’t answer this. Kendrick has done the same – please let us know if you find anyone who can explain biochemically how this happens. 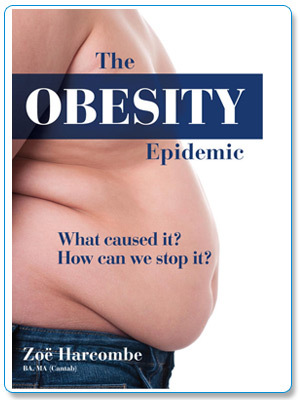 In Chapter 12 of The Obesity Epidemic I go through the nutritional process of fat digestion and the route that this then takes. LDL is the left over from IDL, which is the left over from VLDL, which is made by the liver. There is some compelling evidence presented in my book from people who have made a clear connection between consuming carbohydrate and VLDL levels, but not real fat, found in real food. 1) The Dietary Guidelines for Americans lists the following as saturated fat: cakes, cookies, breads, doughnuts, potato chips, corn chips, popcorn, ice cream etc – these are all primarily carbohydrates and most have more UNsaturated fat than saturated (not that either of these is better or worse than the other if eaten in real food provided by nature.) For decades we have been talking about processed carbs when we have been demonising fats – we don’t even know our macronutrients! 2) Did you know – in 100 grams of normal pork chop (with a trim of fat) – 75g is water, 21g is protein, 1.8g is monounsaturated fat, 1.5g is saturated fat and 0.5g is polyunsaturated fat. Beef, pork, chicken, lamb, rabbit, whale – all have more UNsaturated fat than saturated – again – in real food, nature puts saturated and unsaturated fat in foods in the ‘right’ quantities. I can only find one meat so far, Venison, that has more saturated than unsaturated fat (and Venison is very low fat generally) and yet dieticians and government advisors bang on about the saturated fat content in meat. 3) I am primarily an obesity researcher so, even though the book was out on 14 October, I am still researching stuff – last weekend I took the WHO (world health org) data for 192 countries and ran a correlation between the average cholesterol levels for each country (for men and women) and the heart and stroke death rate in each country. There was a small relationship for men and a moderate relationship for women between cholesterol levels and CVD deaths – but it was inverse! Higher cholesterol levels were associated with lower deaths and vice versa. I then repeated the exercise for total deaths and cholesterol and the “r”, correlation coefficient, was 0.66 for men and 0.74 for women – strong – and again inverse. This says that lower cholesterol is strongly associated with higher deaths, and vice versa, in both men and women. If anyone is trying to lower your cholesterol – you need to take charge of your own health. Why would this happen? Statins (which inhibit the body from doing one of its most vital roles – making cholesterol) are enormously valuable. Lipitor alone is worth c. $12 billion. I can’t think of any other reason – because the evidence from every country in the world is that you do not want lower cholesterol! If you like this – you’ll love my book. One myth busted after another – all fully referenced (the 400 references are on this site) – and all evidence based. Hang on to your cholesterol and remember what LDL is! What about high LDL cholesterol levels? What do you recommend to reduce bad cholestorol or does it ned to be reduced?